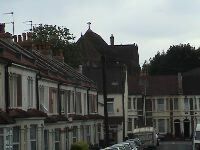 Psand.net is involved in a collaborative study to investigate the feasibility of constructing a community wireless network based on IEEE 802.11b WiFi standards in the ward of Easton (Bristol, UK). This page is a write-up of the progress made there between June and August of 2002. 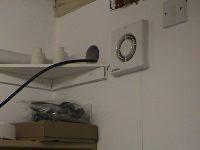 When the project started in June, Easton Community Centre had already acquired a 2Mbs ADSL line and the aim was to prove that a portion of this connection could be successfully shared between a number of local residents or community groups by using wireless technology. 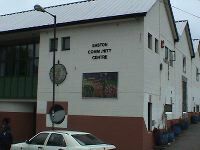 The project set out to provide access to facilities within the Easton Community Centre, as well as standard Internet services such as e-mail and web-browsing, and ultimately to demonstrate that such Internet and CLAN connectivity could be provided in a cost-effective and scalable manner. Network models for managed and ad-hoc wireless networks. Logistics of mounting antennas on homes. Wireless routers, repeaters and gateways. Reuse and recycling of both computer equipment and other materials to construct antennae. Are passive repeaters a reality? In the above list, a special mention should be made to the principles of recycling and reuse. This is of special interest to many local groups and individuals, in an attempt to introduce some of the collaborative practices promoted by Agenda 21. This document intends to cover what we were able to achieve and how we achieved it, giving as much detail as possible (with supporting links to other documentation). It explains how one would go about constructing such a community network, as well as how others in the Easton area may connect to and expand the existing installation. It should be noted that this document is a work in progress, and as such, is incomplete. There is a lot of information has yet to be added by other members and contributors to the project. Please feel free to send any comments, corrections or additions to wireless@psand.net. 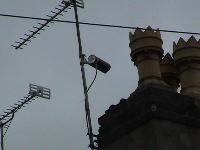 A dedicated web site for this project can now be found at www.bristolwireless.net. The CLAN project has the broad goal of providing the community of Easton in Bristol with a local network built upon the 802.11b wireless network standard, with an eye towards the emerging 802.11g standard. CLAN will serve to provide community-oriented communication and forums with media services provided from a central server, and also act as a gateway for high-speed, low-cost Internet access. The installed network will comprise of a scalable node-based server architecture situated in the Easton Community Centre, and a number of wireless devices situated at test locations within the Easton watershed. 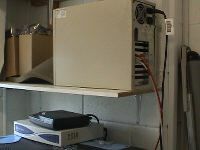 The server-ware will provide data storage, archiving and media services, accessible to the local community network, as well as providing access to the Internet. These services will be delivered to locations within Easton via the wireless network. Internet access will initially be delivered through broadband Internet service such as ADSL, with a view to the use of other equipment, such as a bi-directional satellite connection or fibre for ultra-broadband connectivity, as and when the need arises. Aside from the objectives laid out above, the Community Local Area Network has an evolving structure defined by the activities and creativity of the members of the local community. 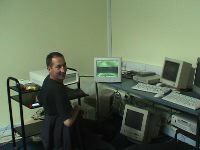 The Easton Community Centre had been provided with the funding for an ADSL connection for a project called Learning Street, along with a network of Compaq PCs that were to be used for teaching computer and Internet skills to local people. As part of this project, a self-contained firewall, Internet gateway and user account and e-mail box had been supplied by a company called Inty. As the CLAN project was independent from Learning Street, we did not use this box for the CLAN network, although part of the eventual purpose of the project is to extend the Learning Street (and other) community based projects to other locations in the local area. When we arrived, the ADSL was installed and running. The line was connected to an ADSL ATM Adaptor from Efficient Networks. This adaptor had an integrated four-port hub and so we were able to use one of these ports in order to have a fixed IP address for incoming Internet connections. 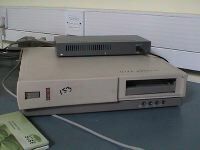 The port from the ADSL was connected to a recycled Intel 80486-based PC running a version of the GNU/Linux operating system with firewall software to control incoming connections to the network. The firewall was configured with NAT support, allowing the port-forwarding of certain network services (such as HTTP and SSh) to the internal CLAN Servers. 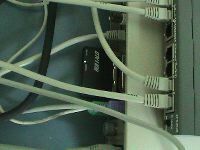 From the firewall, a myriad of cables, hubs and switches provided the backbone LAN for the internal CLAN Ethernet network at the community centre. In order to provide community network services, in accordance with the concept of CLAN, Psand.net loaned, installed and configured two servers. One was an Intel-based server running Debian GNU/Linux 3.0 and the other a Sun Microsystems SPARC Ultra II workstation running Solaris 2.5.1. The Apache web server for hosting a CLAN project portal. Apple's Darwin Streaming Server for streaming audio and video. FTP using the ProFTPd server. OpenSSh for secure remote access. The Solaris server was configured to provide standard DNS and e-mail services using Bind and Sendmail respectively. Outside access to these servers on the Internet was facilitated via the NAT facility of the firewall. The community centre acted as the first main node in what, theoretically, would eventually be a large, high-speed ring forming the backbone of the network, not only in the local area, but potentially throughout the city of Bristol; each main node in the network being connected to it's adjacent main nodes in a ring. A standard Buffalo WaveStation wireless bridge was adapted for attaching an external antenna by use of a pigtail (a short cable that adapts the proprietary connector from the wireless card to a standard N-Type male connector). The pigtail was then connected to a URM67 cable with N-Type connectors and exited through the wall and to the sector antenna. Central Node Buffalo with Pigtail. 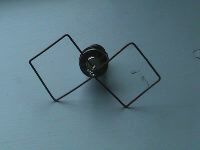 A bi-quad sector antenna was constructed using an N Type bulkhead connector suitable for connecting to URM67 cable with a CD-sized metal disc, connected to the ground-plane with copper wire in the shape of a bow tie soldered to the positive pin. 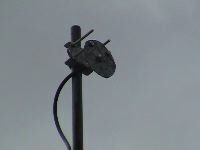 The sector antenna was mounted on a pole, fixed to the community centre on the outer wall adjacent to the centre's server room. It was then directed across the local park towards where the client nodes would be installed. 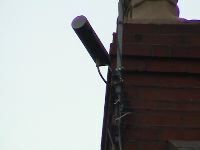 A URM67 cable was then fed through the hole in the wall and connected to the sector antenna at one end, with the pigtail of the Buffalo base station at the other. Close-up of Sector bow tie. At the client locations, we used wave-guide antennae, constructed from recycled whiskey tins, which were then mounted on the chimney stacks or existing YAGI television masts, in order to fall in line with local planning permission guidelines. A URM67 cable then ran down from the wave-guide antennae and through a hole drilled into the wall of the house to the room where the client equipment was being installed. Once the signal is carried from the wave-guide antennae through the URM67 cable, there are several options for how to bring the network connection to computers at the client node, depending on the equipment and intended application. The first and simplest configuration, where a user simply has a laptop (or a PC with PCMCIA-PCI/ISA bridge) and a wireless PCMCIA card has already been discussed here, but for many applications, additional hardware is needed. 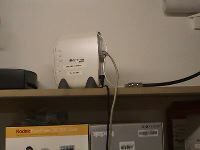 We therefore used the concept of a CLAN Box: a recycled PC configured to act as a bridge or router between the incoming wireless connection and a number of local computers, connected together via an Ethernet or WiFi network. This lead us to investigate some of the issues arising from the use of recycled computers, and also the implementation of wireless node-to-node security. To build CLAN Boxes, we had a selection of recycled PCs that had been donated to the project by various local businesses, as well as residents. Most of these were first generation Pentium class machines with PCI buses, and we installed PCMCIA-PCI bridge cards to enable us to use the Buffalo WaveLAN wireless PCMCIA cards with them. Machines had Debian GNU/Linux 3.0 installed on them and were configured for wireless support for the PCMCIA card, which uses the Hermes/Orinoco compatible drivers. 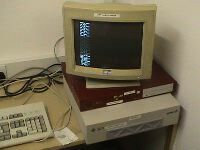 However, in addition to standard PCs, Bails obtained some DEC Multia slimline PCs from the University of the West of England. These machines looked ideal as they actually had two PCMCIA interfaces built into the machine, and having no CD-ROM drive, were small and compact. Therefore we worked on getting a working Debian GNU/Linux kernel on these machines, which was not particularly easy as it required the installation of GNU/Linux onto the machine's hard drive from another PC, (due to the lack of CD-ROM), and then the re-installation of the hard drive in the Multia. We had numerous problems with getting Linux installed and running correctly, and particularly with getting the wireless cards and PCMCIA interface running under GNU/Linux. Eventually, Bails was able to configure one of the boxes as a router that gave out DHCP addresses. More information on the configuration of the DEC Multia machines will be posted here or included on a separate page. Try a Google search for more information. The diagram below shows the network model that we implemented for this first trial of a basic topology. It should be noted that this model is not obviously sufficient for the large-scale roll-out of such a network. It would require the use of many active repeater stations and the use of ad-hoc mode wireless networking at each client node in order to be able to fully connect the masses to the CLAN. One idea for a larger scale network would be to establish a ring of central nodes that are interconnected to each other, via the use of wireless networking, but at a higher capacity than that of the connections between the central and client nodes. This could be achieved using the higher-capacity 802.11a standards, which uses the 5GHz band and therefore would not interfere with the 802.11b networking, which operates in the 2.4GHz band. These interconnected central nodes would form a backbone 'ring' or 'mesh' (depending on topology) and be used to route traffic quickly around the CLAN. At each central node, it would be preferable to have a reasonable connection to the Internet so that traffic destined for outside the CLAN could be routed through its shortest path, rather than across the entire backbone. The CLAN Network (click to enlarge). Passive repeaters are the panacea of the 802.11b wireless community at the moment. A repeater is something that will relay a signal to make it travel further or go around corners or large objects, etc. Normally a repeater requires some form of power to do this and this type is known as an active repeater. 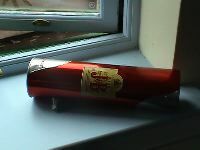 However, there was some furore caused in the community when a chap called Bob Cringley wrote an article about how he constructed such a passive repeater with a couple of antennae placed back-to-back and not even physically connected. So far Bob Cringley has failed to demonstrate his passive repeater working to anybody else and, (to our knowledge), no-one has succeeded in proving his claim. In addition, there is some speculation amongst the wireless community that his success may not have had anything to do with his repeater whatsoever. We are simply stating that we have experienced some rather bizarre results when aligning the wave-guide antennae on the houses, with the sector antenna at the community centre. We found that, at a distance, the signal we got when pointing the wave-guide towards the local church, (which is in range of the sector antenna), was actually better than when pointing it directly at the sector. It should be noted that the church had clear line of site between both antennae, whereas between the sector and the wave-guide there was at least one house roof partially obscuring the signal path. Apart from the general observation that radio waves can do very peculiar things when put into open air with obstacles, it is difficult to ascertain quite what is happening. We can only conclude that the church was acting as a form of passive repeater. We plan to do further studies on this and come up with more conclusive results. As passive repeaters are a reality at other frequencies / powers and we are currently experiementing with the design and construction of a mountable version. Rolling out a wireless network in an actual community is much easier said than done! Getting permission to climb on someone's roof, drill holes in their walls and enter homes to do installation can take some time. Finding people who are both keen to have connection and who live within an acceptable range of the central node is not always that easy. These problems are further compounded when the house is rented. When recycling PCs, a number of issues come into play, especially when installing them into people's houses. All machines should be tested for compliance with electrical appliance safety standards, as well as have licensed software (which is another good reason for using free software). In addition, it can be time-consuming to configure and test machines to make sure that they are suitable. In the world of IBM compatible PCs, where each make and model has different components, the ability to standardise on software installations can be tricky. Attempting to use batches of the same computer is the optimum solution to this conundrum. Also, you have to draw a line somewhere, some kit is just too old to use. Climbing on roofs is dangerous, especially those of most houses in Britain, which have both a very steep pitch, as well as lichens and mosses on them that further reduce available purchase. We recommend that, unless you are familiar with such activities, you do not do this yourself and pay a professional rigger to do the official mounting. Any rigger familiar with mounting television aerials will be able to do this for you. So far the project looks very promising. Four houses connected to a single node is a good start and has proved some of the theory. We made good use of recycled and homemade parts to do the project, and those that are connected have reported no failures to their connectivity since they went live in July. We are currently looking for volunteers to extend the network and funding to continue the project. If you are interested in following the CLAN project further, becoming involved, setting up a node or can offer your time or funding to the project, please visit the official project web site. Mounting a second sector antenna at the community centre to cover a different quadrant and provide greater range. Get up to 12 more houses connected using wave-guide antennae. Further research into passive repeaters. Construction of ad-hoc mode networks from some of the houses with wave-guides. To mount a wave-guide + sector active repeater on a tower block in the Lawrence Hill area (adjacent to Easton), to increase the network's reach. Attempt a line-of-site, wave-guide to wave-guide connection between Easton (or Lawrence Hill) and the Clifton area of Bristol, which is on the other side of the city. Contact and collaborate with other wireless projects in the Bristol area, with the potential of networking the projects together to produce a wireless backbone for the city. Credits are still in progress. Apologies to anyone we have overlooked. 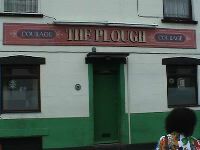 The Plough, essential for good reception. Copyright (c) 2002-2005 Psand Limited and Bristol Wireless Community Co-operative Ltd. Permission is granted to copy, distribute and/or modify this document under the terms of the GNU Free Documentation License, Version 1.1 or any later version published by the Free Software Foundation; with no Invariant Sections, with no Front-Cover Texts, and with no Back-Cover Texts. A copy of the license is included in the section entitled "GNU Free Documentation License".